IN AGREEMENT: Both NatRoad CEO Warren Clark, left, and WA Senator Glenn Sterle, right, would like to see a return of 30-day payment terms. TOO many contracts for road transport services contain unfair payment terms, according to the National Road Transport Association (NatRoad). "NatRoad has seen an increasing tendency for payment period to extend to 90 days. But 30-day minimum payment terms are a must for the road transport industry, which is characterised by tight margins, and intense competition,” said Warren Clark, CEO of NatRoad. 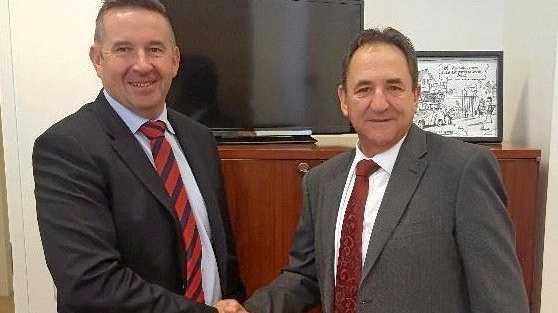 WA Labor Senator Glenn Sterle, the shadow assistant minister for road safety, has already indicated to Big Rigs that the mandating of 30-day payment terms is high on his priority list, should Labor be elected in May. "Our members have told us that lengthy payment terms are becoming more common. In particular, members should check their contracts so that provisions which permit the client to withhold payment of disputed invoices are not part of the agreement to provide transport services,” said Mr Clark. "We have analysed contracts for members where a trap is set for not meeting timing or document submission deadlines. Mr Clark said NatRoad considers that a contractual term requiring payment beyond 30 days has all of the hallmarks of an unfair contract term.